The International Space Station seen from orbit. Image uploaded June 9, 2014. 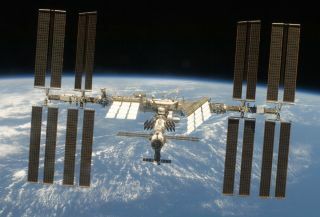 The next U.S. spacecraft designed to deliver astronauts to the International Space Station also needs to act as a lifeboat if something goes wrong on the orbiting outpost. NASA officials hope to find the next astronaut lifeboat — the first American one in 40 years — through the agency's Commercial Crew Program. The space agency is partnering with private companies to find better ways to explore space from American soil. Boeing, Sierra Nevada Corp. and SpaceX are all currently developing new spacecraft that could bring NASA astronauts into orbit and keep them safe if disaster strikes the space station. "You've got to make sure it provides the same capability on day 210 as it does on day one," Justin Kerr, manager of the NASA Commercial Crew Program's spacecraft office, said in a statement. Therefore, the new ships will have to be able to wake up from a sleep state at any time during one of its months-long periods parked at the station, and perform as well as it did on the first day. At the moment, the lifeboat function on the space laboratory is filled by two Russian Soyuz craft, each of which can seat three people. There can only be as many crewmembers aboard the station as can fit in the two Soyuz vehicles, so when the two craft are parked at the station, only six space fliers can be on the station. When one Soyuz leaves to take three astronauts back to Earth, no more than three astronauts can stay behind. There are other criteria as well: The new craft must remain functional for a full seven months, keep the station crew alive in case the craft has to be used as a shelter, evacuate the crew quickly and safely, survive being pummeled by micrometeoroids, deliver four astronauts back to Earth and keep its air supply well circulated. In outer space, the air inside a man-made environment can "develop dead spots, or sections of the cabin without air for breathing, unless there is something to move the air around," NASA officials said in a statement. "You don't want someone to go into the spacecraft and immediately pass out because there's no breathable air in that one area," Scott Thurston, deputy manager of the Commercial Crew Program's spacecraft office, said in a statement. The first component of the International Space Station reached orbit in 1998. Since then, the station has hosted 204 people and has been visited by spacecraft from Russia, Europe, the United States, Japan and private companies. The station covers an area as large as a football field.